“All four red panda pairs at the Smithsonian Conservation Biology Institute in Front Royal, Va., successfully bred and had cubs this year. Of the 10 cubs, more born at SCBI than any other year, seven have survived. The latest pair to have cubs was < ahref="https://www.popville.com/2014/01/red-pandas-rusty-and-shama-have-moved-to-virginia/" target="_blank">Shama and Rusty, who are best known to the public. Rusty gained national attention in June 2013 after he escaped from his enclosure on Asia Trail at the Smithsonian’s National Zoo. Shama, an experienced mother, gave birth to three cubs June 26. This is the first litter Rusty has sired. Keepers had been monitoring Shama closely the past few weeks since her behavior indicated she might be pregnant. Keepers are observing the cubs via a closed-circuit camera, and the cubs appear healthy. Rusty and Shama’s three cubs join three other litters born within the past five weeks. Two cubs were born May 27 to female Yanhua and male Sherman. It was their first litter. Two more cubs were born June 16 to female Regan and male Rocco. One cub was stillborn; the other is being hand-reared to increase chances of survival. The surviving cub is currently in critical condition and receiving round-the-clock care. Keepers took extra steps to prepare for the birth of Regan’s cubs. She has given birth before, but has neglected cubs in the past. As a result, keepers trained her to voluntarily participate in ultrasounds, and they moved her to the veterinary hospital before the birth and monitored her 24 hours a day when she began showing signs consistent with an impending birth. Regan is very genetically valuable to the red panda population in human care, and keepers took every precaution to increase the likelihood of a successful birth. Two cubs were also born to female Low Mei and male Angus June 18; however, one died shortly after birth. Keepers and veterinarians are closely monitoring the surviving cub, and it appears to be healthy. 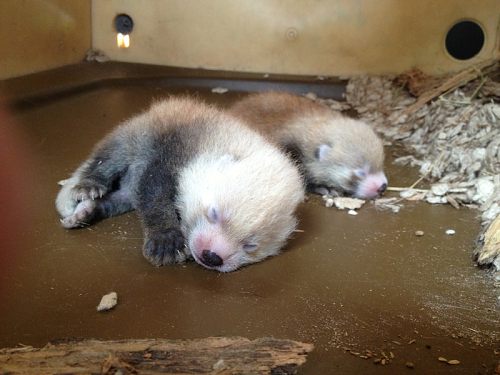 Including the births this year—more than 100 red pandas have been born at SCBI—60 have survived. The survival rate for red panda cubs living in facilities accredited by the Association of Zoos and Aquariums is about 50 percent. Red pandas typically give birth to litters of one to four cubs after a gestation period of about 134 days. Cubs stay in the nest for about 90 days and remain close to their mothers until the next mating season. They reach adult size at about 12 months. The species is listed as vulnerable primarily because of habitat loss. Red pandas live in the cool, temperate bamboo forests in parts of China, Nepal and northern Myanmar. There are fewer than 10,000 adult red pandas left in the wild. Rusty came to the Smithsonian’s National Zoo as the result of a Species Survival Plan breeding recommendation. Shama had been living at the Zoo for several years. The pair was moved to SCBI Front Royal in January to encourage breeding. Shama had bred successfully at the Zoo before, but she is sensitive to noise during pregnancy. Because it was possible that increased visitor traffic to see the giant pandas may have compromised successful breeding, animal care staff determined the best chance for a successful pregnancy, birth, and raising cubs for Shama would be at the new red panda facility at SCBI.